Chew toys relieve boredom and massage your puppy's gums during teething. When your dog was a puppy, chewing was probably expected. Even as she made a ragged mess of anything she could get her teeth on, the non-chewing adult beckoned from the future. Now that future is here and your dog still chews. Don’t worry: her habit might still go away. Most dogs teethe when they are puppies. When puppies are teething, between the ages of 3 and 6 months of age, they are also chewing! After your puppy’s baby teeth are gone, she’ll usually stop chewing over time, since the discomfort from her new teeth has disappeared. Older puppies may also go through a chewing stage between at 6 months and a year. Puppies start “exploratory chewing” to learn about the world around them. As long as you keep the learning behavior from becoming a habit, your puppy should outgrow this chewing, too. Some breeds or the crosses of certain breeds can be terrific chewers all their lives. Many hunting and sporting breeds—such as retrievers and setters—are prone to chewing. Terriers, active dogs who bore easily, often chew. In addition, very small dogs or those with rounded skulls and pushed-in faces (brachycephalic breeds) can sometimes retain a number of teeth long after they are supposed to fall out on their own. If puppy teeth do not fall out on their own, your dog may feel discomfort or even pain from too many teeth being crowded into her mouth. Ouch! Retained baby teeth can cause your dog to chew well into her adult years, as well as causing tooth decay and misaligned teeth. Breed, retained teeth and curiosity are only three reasons for chewing. 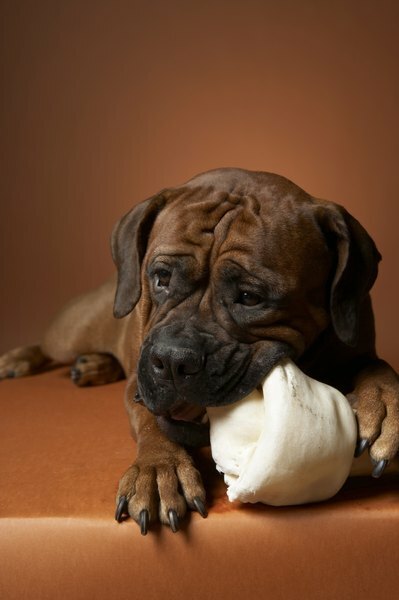 Destructive chewing occurs when your dog becomes bored or anxious. Your dog also vents pent-up energy when she chews. Finally, chewing is just plain fun for dogs. Chewing is a “self-rewarding activity,” which means it provides its own benefits. Whether for pain relief, taste or the pleasure of ripping into something, chewing gives the average dog satisfaction. However, dogs do not chew because they are “getting back” at you. Your Princess might chew because you left her alone, but she's not being spiteful. If Princess chews your good slippers while you are at work, it usually means she was bored or nervous and your slippers were where she could reach them. You must know the reason for destructive chewing behavior in order to correct it. Puppies usually grow out of chewing behavior; having any retained teeth surgically removed will reduce the need to teethe on your prized possessions. Psychological reasons are a bit harder to figure out. If you have moved recently, gotten a new pet or started working different hours, your dog might chew to relieve stress or anxiety. Providing her with interactive toys or “legal” chew items may stop boredom-related chewing of, say, the furniture. And, most of all, if you don’t want her to chew your things—don't leave them where she can reach them! How Do Indoor Cats Get Roundworm? Do Dogs Like People Around Their Newborn Puppies?